Do you want an easy, decadent dessert that is sure to elicit ooooohs and aaaaaahs from friends and family? If the answer is "Yes", then you've come to the right place, my friend! To make it super simple I bought a cheesecake, and as a bonus it was already sliced into wedges, just waiting to be dipped. I picked a cheesecake sampler which included fabulous flavors: peanut butter, strawberry, turtle, and chocolate chip..something to please everyone. I chose the strawberry swirl version to try, and it was deeeeelicious! What fun it would be to cover each bar with an ingredient that would hint to what's under the chocolate~peanut butter chips, mini chocolate chips, dehydrated strawberries, or a drizzle of caramel. 1. Remove frozen cheesecake from the freezer and insert a popsicle stick about 2-inches into each wedge(If it's difficult, make a small slit with a sharp knife to get it started). 2. Place the cheesecake back in the freezer until it is frozen solid. 3. Melt the chocolate according to package directions (I used the microwave). I placed the chocolate in a deep, small-ish bowl to make dipping easier. Stir melted chocolate until smooth. 4. Line a baking sheet with aluminum foil (shiny side up). Take a cheescake pop from the freezer(one at a time), hold it by the stick and dip into the chocolate (I used a spatula to make sure each was completely covered). Let the excess chocolate drip off over the bowl, and then lay the bar on the aluminum foil. If you want to add decorations, do so at this point. Repeat with each wedge. Freeze (if needed) for about 15 minutes. Serve and enjoy! Oh my heck!!! I about fell off of my chair! These sounds so darn delicious!!! I wish I had a slice right now to munch on while I'm reading this! Yum, yum... can't wait to try dipping some cheesecakes! Those look really good! 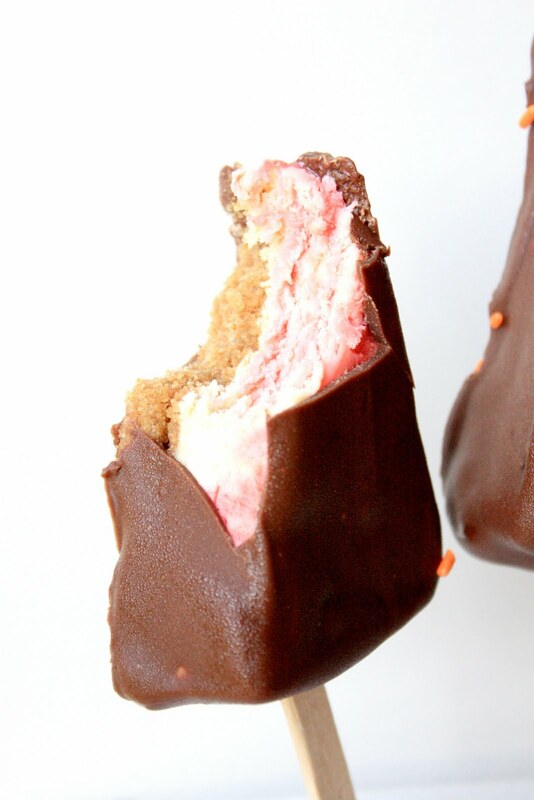 I was thinking of making a semi-raw vegan version of these with some strawberry "cheesecake" soon. LOVE IT! That is such a neat idea! YUM! Oh my gosh! What a naughty, but yummy, treat! What a fabulous idea too! I am super impressed. This is such a fabulous idea! Wish I could reach in and grab one. Yummy this seems like a simple but tasty dessert! I saw that in last months issue too! I ripped out the page and everything. Now I really want to try it! I'd love for you to link up on Tuesday with me at Crazy Sweet Tuesdays! You are magic! These look incredibleeeee! o my lord...where did you get all those crazy and creative ideas!!! 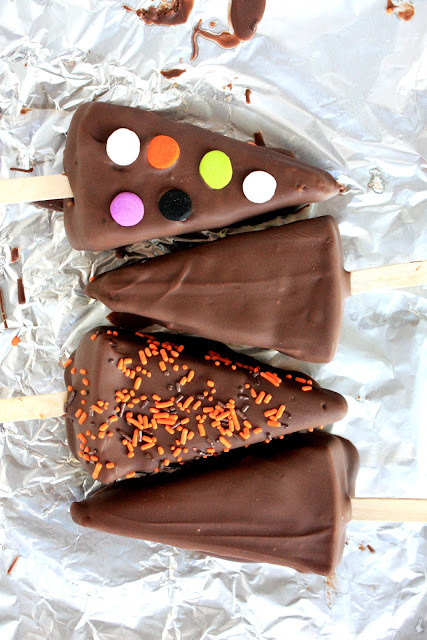 I love those cheesecake bars on a stick! What a great idea! Everyone loves cheesecake. You can also change up the sprinkles for the holidays. Love it! Thanks for sharing on Sweet Indulgences Sunday. Wow, that does look delicious! What a fun idea. Leave it to you to take this dessert idea to the next level! Awesome idea. I've made these before and they are incredible. If someone gave me some of these I would be in heaven!!! Can you hear me moaning from Florida? What a decadent, amazing, wonderful treat! I think using a store bought cheesecake was the right way to go. It always seems firmer than my homemade versions. Cannot wait to try this. Yum! I have never seen such a thing before. What a great idea! Looks so decadent and delicious! Oh yum! I haven't had a good cheesecake in a good long while -- I think it's time to end the drought =D. I'm not sure it gets any better than chocolate-dipped cheesecake! Oh my! We were at a restaurant last weekend and they served chocolate-dipped pecan pie. It was sinfully rich...but I think I like this idea better! This is awesome! Love this. Oh my, these look good!! What a cute idea! And they sound yummy! I'd like to invite you to link up at my Friday Favorites party! Oh my gosh those sound awesome. And pumpkin would be delicious I am sure. I watched the episode you are referring to! I thought the dipped cheesecake looked amazing and it is neat to see you trying it out! First Time here! Oh soooo lovely!!!!!!! Re-Donk-U-Lous....they look awful, just awful. Terrible. Great post! I'm linking this to recipelionblog.com! PS. I am your newest follower :) Fun blog!